Herb flowers are generally small and delicate and that is their charm. Yet they still make a show when plants are massed in the garden or blooms are cut and bunched with other flowers for natural looking flower arrangements. Herbal fragrances tend to be aromatic and this makes them useful for freshening rooms and cupboards too. By not being too sweet, their effect is not cloying or overpowering. Gardeners, generally, don’t grow herbs for their beauty and fragrance, but if one considers these additional criteria, it adds inestimably to one’s pleasure in cultivating herbs. Herb flowers are particularly sought after by pollinators and that adds to the health of the garden and its fruitfulness. A flip through any herb catalogue produces a surprisingly long list of herbs with lovely flowers and some, like the many lavenders and catmint, long ago escaped into the flower garden. • Liquorice mint (Agastache) grows 1m high and is a woody-based perennial with soft blue flowers throughout summer into autumn. The leaves have a minty-anise fragrance and may be used in potpourri. It grows in full sun, in fertile well drained soil. In cold areas the plant dies down in winter. Other tall growing herbs (80cm to 1m or higher) are Bergamot (pink/red flowers), Dill (yellow flowers), Echinacea (white or dusky pink flowers), lemon verbena (white flowers), passion fruit daisy (yellow flowers), pineapple sage (red flowers) and Sutherlandia frutescens (red orange flowers). • Feverfew (Tanacetum parthenium) is a medium high plant (60cm) and one of the most attractive flowering herbs because of its masses of white daisy like flowers and aromatic leaves. Feverfew can be grown as an annual or a perennial. It needs full sun and can grow in poor soil, as long as it drains well. It is drought tolerant. The leaves and flowers have are used to lower fever, and as a safe remedy for migraine and severe headaches as well as rheumatism. Other medium high herbs (50 to 60cm) are pink and white perennial basil, Margaret Roberts lavender (mauve blue), and rosemary (blue or white). • Catmint (Nepeta mussinii) is a low growing perennial with a height and spread of 30 to 60cm. Its soft grey-green foliage and profusion of spikes of mauve flowers makes it an excellent border plant. It can be trimmed throughout the season to keep it neat or if the centre falls open. It will re-grow and flower again. It multiplies quickly and clumps can be divided in spring and planted out. The leaves act as a tonic for cats and bees love the flowers which makes this an excellent plant for bee friendly gardens. The leaves can be used in teas and salads and the flowers for garnish. • Plant three of a variety together for impact, rather than sprinkle single plants throughout the bed. • Perennial flowering herbs combine very well with other perennials that have similar requirements, such as daylilies, irises, and roses. • For greater impact, opt for different hues of a single colour. • Plant tall herbs at the back of a bed and shorter plants to the front. This is a classic combination, even though roses need more water than lavender. Lavender won’t mind receiving as much water as the roses as long as the soil drains well, and only the base of the plant is watered, so that the foliage doesn’t get wet. This reduces fungus disease. Spacing the lavender for good air circulation also helps keep the foliage healthy. Use lavender and rose petals to make pot pourri, and in fresh flower arrangements. 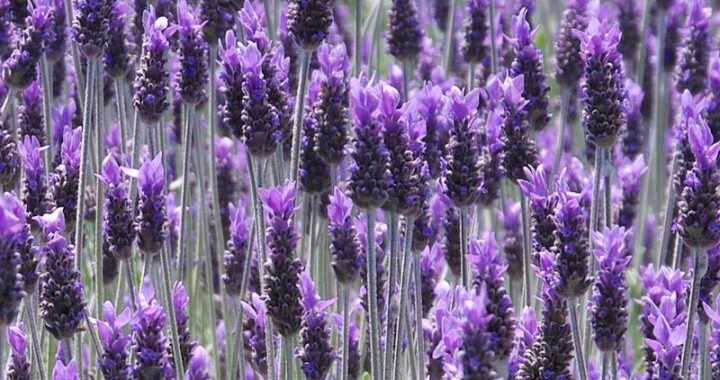 Lavender flowers can also be dried, by hanging up bunches in a cool, dry room. Tip: Dried lavender flowers that lose their scent can be revived by putting them in a steamy bathroom for a white or gently spraying them with water. • Bronze fennel (Foeniculum vulgare) is a tall herb (up to 1m) for planting at the back of a bed. Its bronze foliage and plate-sized yellow flowers provide contrast and texture. The flowers last well in the vase. Bronze fennel needs full sun, well drained soil, and may die down in winter in colder areas. For organic gardeners the flowers act as a trap for beetles, which can simply be picked off by hand. • Echinacea purpurea grows 1.2m high and produces large daisy-like pink or white flowers with a prominent central orange-brown cone on single strong stems in summer. It grows in full sun. In cold areas it will die down in winter. • Lavandula dentata, stoechas or intermedia varieties (like Margaret Roberts’ lavender) vary in height, flower shape and colour and length of stem. The dentata varieties have the sturdiest flowers while the stoechas are the showiest. Margaret Roberts’ lavender is particularly good for drying. Lavender flowers last longer in a vase that is only a third full of water. Change water daily and keep flowers out of direct sunlight. Fragrance adds another dimension to the herb garden and multiplies the pleasure of growing herbs. Aromatic plants, like lavender, rosemary, lemon verbena and scented geraniums, need to be touched to release their fragrance so they can be used as borders, along paths, in containers, or next to benches where you can easily brush against them or rub the leaves with your fingers. Rose Scented Geranium is an attractive, mediums sized bushy shrub that has small mauve flowers in summer. It is evergreen and frost tolerant. The leaves have a strong rose fragrance that can be added to bath water, infused as a mild astringent and included in potpourri and pillows for a relaxing and soothing lemon-rose fragrance. It grows best in full sun but tolerates light shade. It grows easily in any soil that drains well and compost should be added before planting. It also performs well in a container. • Yellow foliage such as golden oregano can be as effective as flowers in adding colour to a border. • Use herbs with grey foliage (Artemisia, Dutch lavender, sage, Santolina) to soften stronger colours and give the garden a luminous quality on dull days. Posted in Aromatics, Growing Herbs and tagged bergamot, colour, flowers, fragrance, freshening, geranium, herbs, lavender, lemon verbena, rosemary.